The drugstore experience has always suffered from a debilitating overabundance of products (shampoo AND conditioner?! 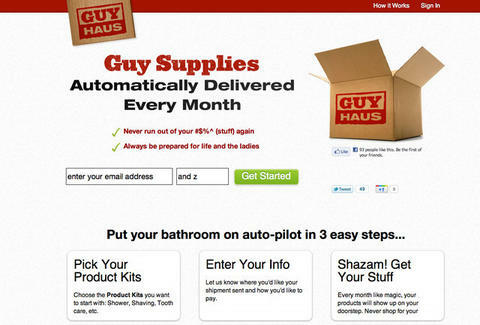 ), as well as a serious dearth of cowboys, despite Gus Van Sant claiming it's totally the place to find them; now a Philly-educated web-trepreneur's making it possible for you to avoid that depressingly Kelly Lynch-less place altogether by harnessing the power of the Internet to auto-deliver all manner of man-essentials to your pad with the promise you'll "never run out of your "#$%^ again". To get started just hook 'em up with all your info, then pick the items you typically forget to buy, including the basics (TP, deodorant, razor blades, toothpaste, shampoo, soap, GI Joe's 25th Anniversary Edition Storm Shadow action figure, mouthwash, etc. ), as well as things like condoms, unless your gambles on taking someone home from the bar keep coming up Snake Eyes. Once you're set, a box of goodies’ll arrive during the middle of each month; plus you can hook up alternate-month deliveries for whichever items you notice you're not using regularly...wait, still condoms?!? WTF is all this deodorant for then? GH's so clever that once you've used it for a bit, you'll start getting freebies in your box as their marketing partners figure out what you really, really need, which is great since you can never have too much of a good thing, just ask Heather Graham's charact...um, well, maybe you should ask Matt Dillon's instead.